Home » block lotto community » Setting idea for Duds and Orphans? Setting idea for Duds and Orphans? 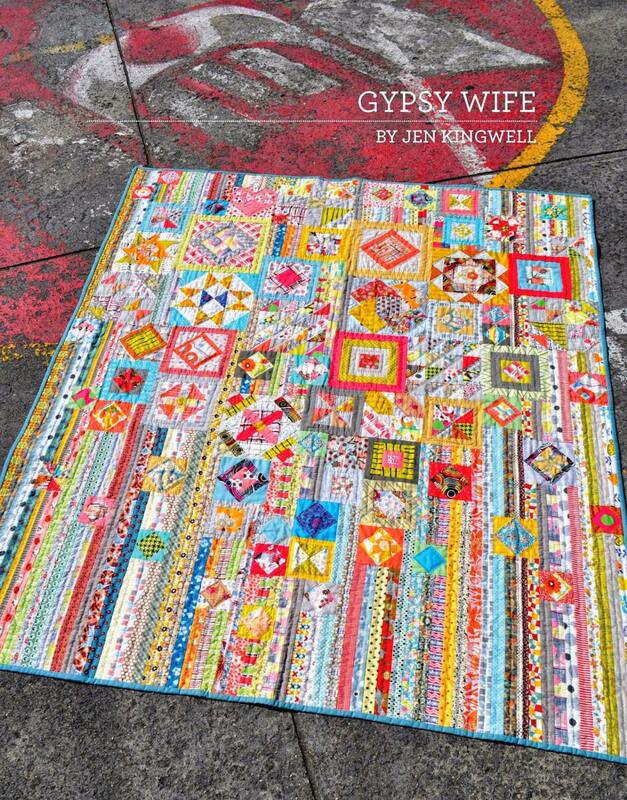 I didn’t win the Duds and Orphans drawing (sniff), but I thought of the orphans last night when I saw this pattern/book, Gypsy Wife, by Jen Kingwell, at the quilt store. It seems like this could be a interesting setting for an assortment of random blocks if you could pick up colors from the orphans for the striped part. I have some BLotto related orphans that might work with this. I had not seen her work before, but her patterns are right up my alley–scrappy and bright! GMTA! I know that one of the winners is considering this for their blocks. It’s a great idea for anyone who has some orphans and duds at home or wants to make a bunch of diverse sampler blocks. I was thinking the same thing. City Quilter store in NYC has a modern block sampler class. I can’t take it, but I might just start making them on my own. This might also work for someone learning liberated blocks. I was one of the orphan block winners. After looking at this layout I have decided to use my red/white Block Lotto duds and red/white fabrics to make something like this. There is also a Gypsy Wife quilt along that started in January. There is a Flickr group too. http://www.flickr.com/groups/2517508@N22/discuss/ You can see a pic of my red/white stuff there. I am too cheap to buy the pattrn book, even though it looks very nicely written. I am going to wing it. I haven’t decided if I am going to throw another color in here or there. I was thinking aqua or black or just a little of both. We’ll see what happens. WOW. Thanks for that link. The book seems quite well written and beautifully produced, but I only have so much space in my NYC apartment, so I passed on it as well. Particularly since it feels like I know most of those blocks already. Red and White would be beautiful. Do keep us posted! Wow. I love this. I may have just changed my mind on how to use my dud blocks!